Our outstanding villa is located in the new gated, Mediterranean style resort of Tuscan Hills. 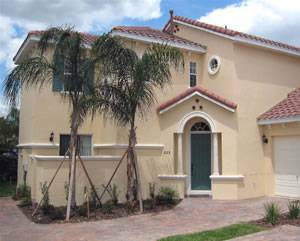 Landscaped with mature palms and trees, the ambiance is one reminiscent of the quiet Italian countryside. 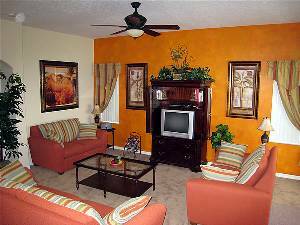 All of this and only 15 minutes away from Walt Disney World and offering easy access to the many attractions Florida has to offer. To the rear of the villa we have a large screened pool and spa, both featuring underwater multi-coloured lights. 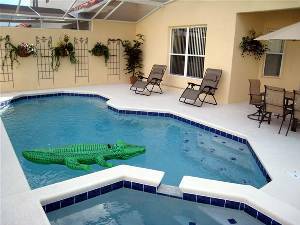 The pool is child-friendly and has a security fence in place for your peace of mind. The spa, being shallow, offers an ideal play area for toddlers and small children. 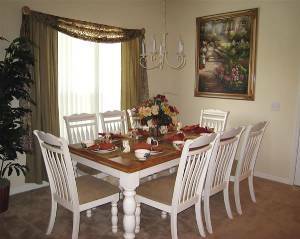 A lanai area with overhead lighting and ceiling fan, is complete with dining furniture. Perfect for alfresco eating or simply "chilling out" following a long day at the parks. The comfortable recliner chairs are just right for topping up that Florida tan. The spacious family room features sumptuous sofas and is decorated in a traditional Tuscan style using rustic tones of green, stone and terracotta. Relax and watch a film from our collection of DVD's or take in a novel from the library of books. When on holiday, we all like to sample the local cafes and restaurants, however, for those occasions when you prefer a family meal in, we have created this wonderful, formal dining area, complete with bright Tuscan style earthenware dishes and benefiting from views of the pool. The modern spacious kitchen is fitted with up to the minute appliances, including fridge freezer with ice dispenser, dishwasher, microwave oven, electric oven with hob and coffee maker. A washer, dryer, iron and ironing board are in a separate utility area. The kitchen also has a breakfast bar with stools. The first of our 2 master suites is decorated in an opulent style. 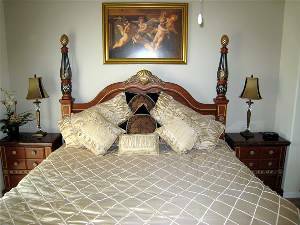 The four poster, king-sized bed is draped in luscious gold coloured fabrics. Sliding glass doors lead to a private patio area which is simply furnished with a tiled table and 2 seats to match. At the end of the day, when the children are asleep, share a bottle of wine and enjoy the picturesque sunset. The en suite bathroom has a large bath tub, walk-in shower and was basin. 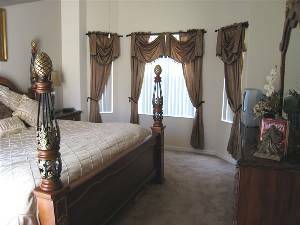 The second master suite also has a king-sized bed, but in complete contrast to the Grand Suite, this room has an "American Country" theme. Roses and rabbits are the feature of this room. 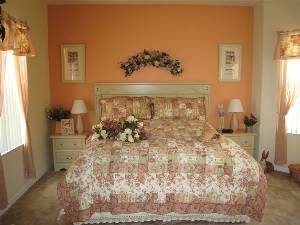 A patchwork quilt covers the bed and the walls are adorned with roses and images of a bygone Colonial era. 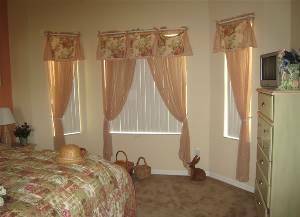 With 3 windows draped in matching peach coloured fabrics, this is a bright and welcoming room. The accessories in the en suite bathroom have been carefully chosen to match the unique decor of the room. The bathroom has a large walk-in shower and was basin. Each room has a television with multiple cable channels.Our villa is absolutely child friendly and equipped with cot/crib, high chair, baby monitor and pushchair/stroller. We also have in each children's room, a selection of toys. The pool has a safety fence in place for your peace of mind. Pets are not allowed and smoking is permitted only outside in the pool area.We provide linen, towels and hairdryers.Local telephone calls are free as is access to wireless internet, just bring along your laptop computer.